There is a widespread understanding within the profession of the general guidelines for care of the concussion patient. These include guidelines for physical and cognitive rest, return to normal activities and so forth. What has not been sufficiently discussed is the potential role of the chiropractic adjustment itself for victims of concussion and post-concussion syndrome. The following is a brief review of a small sample of the evidence within the clinical literature supporting a role for the chiropractic adjustment in concussion care. The manifestations of concussion that responded under chiropractic care in these case reports included deficits in attention, vestibular function and vision. Deficits in attention and short-term memory are not uncommon in concussion. Lovett and Blum (2006) reported the case of a 6-year-old boy who struck his head during a fall from a slide at a playground.1 The impact of the fall knocked the boy unconscious. Eighteen months later, the mother brought the boy to a DC. Although she "did not believe in chiropractic care," the mother was "at her wit's end" due to her inability to alleviate her son's headaches and neck pain with pain medication. In addition to headache and neck pain, the boy was suffering from stomach pains and frequently had bloodshot eyes. Attention-deficit symptoms included an inability to sit still, deteriorating grades at school, and being disruptive and inattentive in class. None of this was present before the cranial trauma at the playground. Sacro-occipital technique (SOT) examination protocols revealed evidence of C2-3 subluxation and category II sacroiliac subluxation. Minimal-force adjustments were utilized, due to the mother's apprehension, at a frequency of once per week for the first two months of care. At three weeks of care, typical spelling test scores were 80 percent (compared to typical scores of 20 percent pre-intervention), along with vast improvement in penmanship. After two months of care, steady academic and behavioral improvement were noted by the school and parents, and the boy's eyes were consistently clear (not bloodshot). Stomach pains, neck pain and headaches also were much improved. Pfefer, et al. 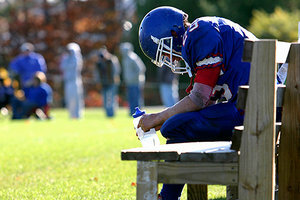 (2011) discussed a 16-year-old football player with daily headaches and neck pain five weeks after a head injury that left him with a sense of "fogginess. "2 He was unable to concentrate on homework. Previous treatment included nonsteroidal anti-inflammatory drugs and narcotics for pain control. Cervical and thoracic diversified adjustments were administered. Significant symptomatic relief was noted after the second visit. Virtually complete symptomatic resolution was noted after the fifth visit (two weeks into care), although return to athletic activity created some exacerbation. Seven weeks into chiropractic care, the patient was able to return to full game play, symptom free. Dizziness and vertigo are common manifestations of concussion. Collins and Misukanis (2005) reported the case of a 30-year-old woman first seen three days after a motor vehicle accident.3 She complained of neck pain, headache, mid-thoracic and upper-shoulder pain, numbness and tingling in both arms, and dizziness. Difficulty finding her car keys suggested a deficit in short-term memory. Active cervical range of motion in all directions reproduced the dizziness. Nine visits over a period of 18 days included low-force diversified adjustments. The patient noted that pain levels were reduced for several hours after each visit. At this point, a neurologist consulted for a second opinion performed an examination and an MRI. The MRI was negative, and the neurologist concluded that the patient had suffered from a severe sprain and strain. The neurologist also advised the patient to continue chiropractic care. The day after the neurological consultation, the patient experienced lightheadedness, a sensation of the room spinning, blurry vision, vomiting and dyspnea. Emergency-room evaluation ruled out stroke and transient ischemic attack. Evaluation by a neuropsychologist revealed a constellation of cognitive deficits, including memory problems and difficulty with complex logical problem-solving. In the neuropsychologist's opinion, these deficits were consistent with post-concussion syndrome. Chiropractic adjustments continued with low force. At six months post-injury, the patient enjoyed complete resolution of neck pain and vertigo. At five months post-injury, the patient sought chiropractic care for residual headache, difficulty in concentrating, and vertigo. Physical and X-ray examination findings were consistent with upper cervical subluxation, and adjustments were administered according to Atlas Orthogonal protocols. At the patient's third visit one week following presentation, the patient noted that she had not experienced any vertigo or headaches since the first visit. Some degree of visual dysfunction is common among concussion victims. Gilman and Bergstrand (1990) described a 75-year-old man who suffered a head injury resulting from a fall.5 He immediately complained of headache and dizziness. The next morning, he stated that he was completely blind. He underwent examination by both an optometrist and an ophthalmologist. His report of blindness was supported by the absence of a pupillary response in both examinations. Cranial CT was unremarkable, ruling out gross brain injury. Although concussion was not diagnosed as such, the clinical pattern clearly fit the category. The patient was followed for three months, with no subjective return of vision or objective recovery of the pupillary response. It was at this point that a chiropractic examination was conducted. The chiropractor found a C1-C2 fixation on motion palpation. He adjusted the patient's upper cervical spine 11 times over a period of three months. After the third adjustment, the patient was able to perceive light. After the 11th adjustment, the patient could see rays of light coming through a window, could distinguish different colors, and demonstrated a normal pupillary response. After another two months of chiropractic care, the patient was able to read. Sweat and Pottenger (2012) reported the case of a 75-year-old woman who had suffered a concussion resulting from a slip-and-fall injury 10 years previously.6 At the time of presentation to the chiropractic practice, she complained of a left "lazy eye", which interfered with reading. Chiropractic physical and X-ray examination findings were consistent with upper cervical subluxation. Extraocular muscle examination revealed a strabismus, characterized by the left eye lagging behind when the patient was asked to look to her right. She was unable to walk heel-to-toe, instead using a wide stance to ambulate. The patient was seen 22 times over a period of 353 days. On the first and 17th visit, she was adjusted according to Atlas Orthogonal protocols. (During the other 20 visits, adjustment was not warranted according to the analysis methods of the technique.) At the time of publication, the patient can walk heel-to-toe and stand on one leg (time was not reported). While left eye control is not perfect, it has improved and she is able to read as long as she wants. Along with this improvement in extraocular muscle function, she also noted improvements in the brightness, clarity and color perception of her vision. These improvements began shortly after the first adjustment and progressed during this period of follow-up. Other concussion and post-concussion manifestations that have been reported to respond well under chiropractic care include slowed reaction time, sleep disorders and depression. I look forward to a blossoming of chiropractic research in these areas over the next few years. Lovett L, Blum CL. Behavioral and learning changes secondary to chiropractic care to reduce subluxations in a child with attention deficit hyperactivity disorder: a case study. J Verteb Sublux Res, 2006 Oct 4:1-6. Pfefer MT, Cooper SR, Boyazis AM. Chiropractic management of post-concussion headache and neck pain in a young athlete and implications for return-to-play. Topics Integrat Health Care, 2011;2(3):1-5. Collins ME, Misukanis TM. Chiropractic management of a patient with post traumatic vertigo of complex origin. J Chiropr Med, 2005;4:32-38. Mayheu A, Sweat M. Upper cervical chiropractic care of a patient with post-concussion syndrome, positional vertigo, and headaches. J Upper Cervical Chirpr Res, 2011 Jan 6):3-9. Gilman G, Bergstrand J. Visual recovery following chiropractic intervention. Chiropr: J Res Chiropr Clin Invest, 1990;6:61-63. Sweat R, Pottenger T. Seizure, ataxia, fatigue, strabismus and migraine resolved by precise realignment of the first cervical vertebra: a case report. J Upper Cervical Chiropr Res, 2012 Mar 12:20-26.